Today is the 75th anniversary of the day one of our sisters made her first vows, aged 23 in the middle of World War II. Any anniversary or jubilee is a cause for celebration, but when it's three-quarters of a century... well, from the lowlier vantage point of my twenty years, I can only look on with admiration and awe! Any anniversary or jubilee of commitment is a cause for celebration, and for looking back, often with wonder and gratitude, at the enduring love and fidelity which have permeated the years. And as Amy's story shows, the gentle assurance of God's fidelity and love has been a constant, especially present the day she made her vows. Wartime austerity in rural Scotland meant the altar could only be decorated with flowers from the garden; wintry weather meant the garden was as bare and unadorned as the altar would be. And Amy resigned herself to this - flowers, after all, were not the essence of the commitment she was about to make, merely the icing on the day's cake. 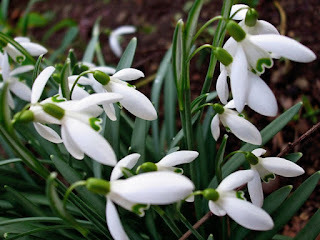 But unknown to her another novice had found a patch of snowdrops, which she had dug up and brought into the house, nurturing them in the linen cupboard so that they would flower in time for the vows ceremony. And so, to Amy's delighted surprise, there were flowers around the altar, their delicate loveliness speaking of God's love, shining through Elise's thoughtful kindness.